No Relationship is Perfect - Something New Everyday! No relationship is perfect. 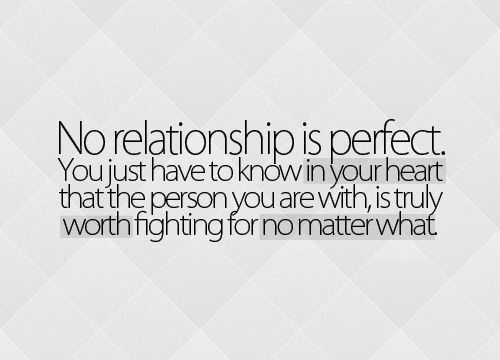 You just have to know in your heart that the person you are with, is truly worth fighting for no matter what. To build in a relationship you must have a great foundation of understanding. Without a good understanding of your partner the amount of love that blossoms will be restrained and will eventually die from a lack of "light." There are no perfect relationships. Anytime two people come together for long periods of time there will be conflict. Of course, some people are more compatible than others, but this just proves our uniqueness even more. One thing to focus on while in a relationship is learning and catering to the needs of your lover. Dont compare who you are with now to a past love interest, an ideal mate, or anyone else. Encourage your lover to grow, but encourage them to grow into their true selves. Dont try to make someone into a person that you would like for them to be by making a scene every time you think they are incorrect. Learn how to pick your battles to help encourage real growth in the people you love, so that you may grow with them instead of without them.